Stasia earned her associates degree at New Hampshire Technical Institute and became a Registered Dental Hygienist in 1996. She earned her Bachelor of Science degree from The University of Rhode Island with a major in Dental Hygiene. Stasia loves children and spends much of her time off educating children about a lifetime of good oral health. Stasia truly enjoys getting to know and caring for all her wonderful patients. Away from work she loves spending time with her daughter. Tonda is a registered Dental Hygienist who graduated from New Hampshire Technical Institute in 1996. When not at work she enjoys being with her two daughters. Her favorite quote from a patient is "Be true to your teeth or they will be false to you"
Tamara (TK) graduated from NHTI in the fall of 2010 with honors. She is also been certified in administering local anesthesia. She has been working in our office since the summer of 2010. When not working with patients to help them improve their overall health, she enjoys spending time with her husband Dustin, son Mason and daughter Piper. Her favorite saying is, "Only floss the ones you want to keep." 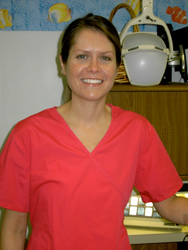 Paige joined Dover Dental Associates in June 2010. She moved here from sunny California several years ago. She has experience in the dental field. Paige is happy to be a part of the Dover Dental team. Tracy joined the Dover Dental team in 1999. Tracy's goal at Dover Dental is to make your visit comfortable, informative and she will be glad to assist you with any questions regarding your account and insurance concerns. Favorite after work activities are kayaking and surfing. Linda has been with Dover Dental Associates for over 10 years. Her focus is taking care of our patient's administrative needs and to make their experience smooth and comfortable. In her spare time Linda enjoys her family and all outdoor activities. Su has been with Dover Dental Associates since 1995. Her position as a Dental Assistant affords her the opportunity to build a rapport and make sure the patient is comfortable. When not at Dover Dental she enjoys teaching at The Works Athletic Club and spending time with her family and friends. Dani has been a member of our team since 2005. She is especially good with our children and nervous patients. Away from work Dani loves spending quality family time with her son. She also enjoys her very smart Boston Terriers Bella and Max.